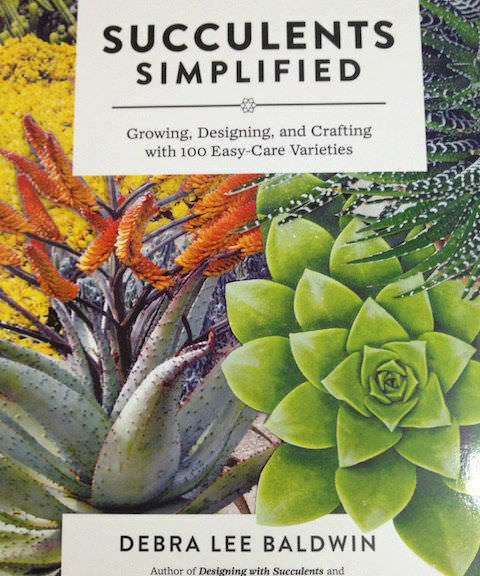 Succulents Simplified – Growing, Designing and Crafting with 100 Easy-Care Varieties, introduces the best succulents for gardens and containers, explains how to grow and use them, and gives step-by-step methods for design-oriented projects. Succulents Simplified is a complete primer on choosing, growing and designing with succulents. Along with gorgeous photos packed with design ideas, Debra offers her top 100 plant picks and explains how to grow and care for succulents no matter where you live. Step-by-step projects, including a cake-stand centerpiece, special-occasion bouquets, a vertical garden, and a succulent topiary sphere, will inspire you to express your individual style. Whether you’re a novice or veteran, have an acre to fill or a few pots, live in Calexico or Canada, Succulents Simplified is a dazzling primer for success with succulents wherever you live! Debra Lee Baldwin, the bestselling author of Designing with Succulents and Succulent Container Gardens, specializes in showing how top floral and garden designers use dynamic, sculptural succulents in a wide variety of eye-catching applications. Her own garden, which has been in Sunset and Better Homes & Gardens, is in the foothills northeast of San Diego, where temps range from below freezing to upwards of 100 degrees.